It's been a busy few weeks since our last post so here's a taster of what we've been up to. 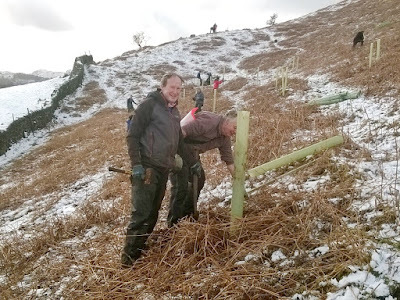 Earlier on, in mid-February, we spent a week tree planting on the slopes of Helm Crag. The work was funded by Natural England. We planted 1800 scrub woodland species over an area of 6 hectares, working alongside other National Trust staff and assisted by some of the Fix the Fells volunteers. 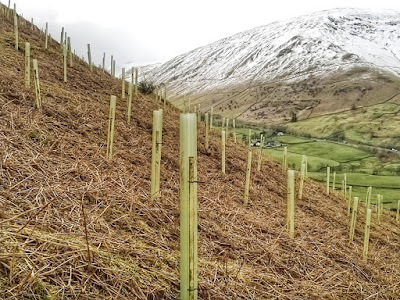 As the trees develop, they will help stabilise the soil and reduce rainwater runoff. They will also provide a valuable habitat for birds, such as Tree Pipit and Yellowhammer, mammals and insects. You can read in more detail about the work on the Central and East Lakes Rangers blog... here, so here are just a selection photos of the work over a very wintery week. 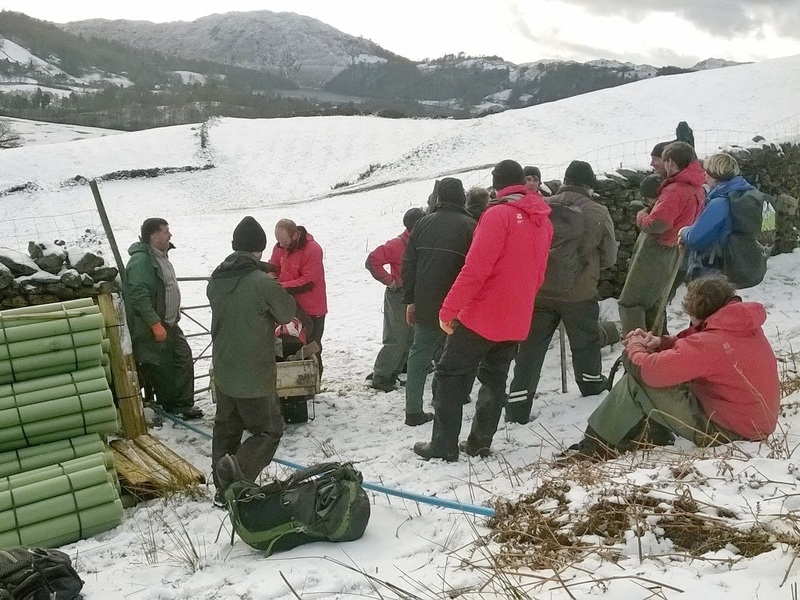 Later on in the month we spent a day carrying out some peat bog restoration work up on Matterdale Common with the Ullswater team and staff from Cumbria Wildlife Trust. Over 70 per cent of peatlands in England are in a damaged state, often due to drainage, overgrazing, forestry or regular burning. This damage prevents the peat remaining waterlogged, causing plants to die off. Without vegetation cover, bare areas of peat are formed which rapidly erode. This damage can be repaired by revegetating and blocking drains to help raise the water table. The project has been overseen by Cumbria Wildlife Trust who've used digger contractors to do the main bulk of the work, but as a member of the Cumbria Peat Partnership we were eager to lend a hand with areas that couldn't be done with machinery. Our main job was to plant heather on the bare areas of peat to help speed up the regeneration process. So we took the trays of heather out into one of the two stock excluded areas on Matterdale Common and planted up in the barest patches. Areas of peat that have eroded (often as a result of grazing, historical peat cutting and water damage) may form steep banks, known as hags. These hags continue to erode, due to water flow and wind damage, forming large areas of bare peat that plants struggle to survive on. By reprofiling the banks to an angle of around thirty degrees it gives the heather seedlings a much better chance to flourish. Many of the hags have been removed using the diggers but we were able to get to a few areas that the diggers couldn't reach and to also work on some of the smaller hags. You can see the area where we were working in the photograph below and also the difference between the grazed and ungrazed areas. The area in the distance was fenced off about 10 years ago allowing heather and other peatland plants to return, this should further improve following the recent work. You can learn more about peatland restoration on the Cumbria Wildlife Trust website... here.